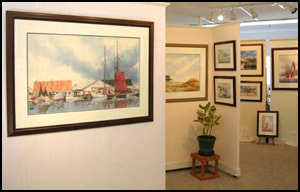 The Andrus Gallery & Studio is located in Historic Downtown Manteo Downtown Waterfront. Nestled amongst dining, shopping, and many nautical historic displays, all walking distance from the studio, you can share Steve's love for the water in this very unique enviroment. Established in 1870 and incorparated in 1899, Manteo is rich in Outer Banks history. The Roanoke Island Festival park, home of the Queen Elizabeth sailing vessel, is alive in the summer season. 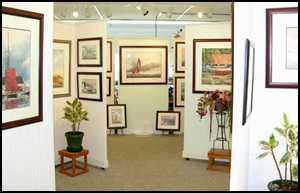 With many outdoor performances and a museum that is dedicated to Manteo and Outer Banks history. There is also the NC Maritime Museum. Home of the George Washington Creef Boathouse, the boathouse houses a number of small craft that represent a portion of the region’s rich maritime history. An original Creef shadboat built in 1883, a variety of sailing skiffs, and a Davis Runabout are on display. All this within minutes of the studio. 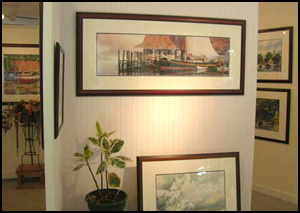 The gallery displays Steve's paintings as well as houses his studio. Steve is always working on new watercolors and would happy to explain how he works. Stop by the studio and say hello and feel free to come back often.